The opening pages of the book confirmed of my second sentiment with longish descriptions of her schooling, personal relationships, and mostly OK London life. But my initial impressions proved to be a miscalculation. Some clues pointed at something intriguing. First clue, she is close to my age and this is important. Robert Fulton and Ted Simon are far older than me. Ewan McGregor, much younger. Beard’s sensibilities and attitudes are more in sync with mine. Second clue, her story begins in 1982. Elspeth will not be updating her Facebook page at every gas stop. Thank goodness. Third clue, her bike. 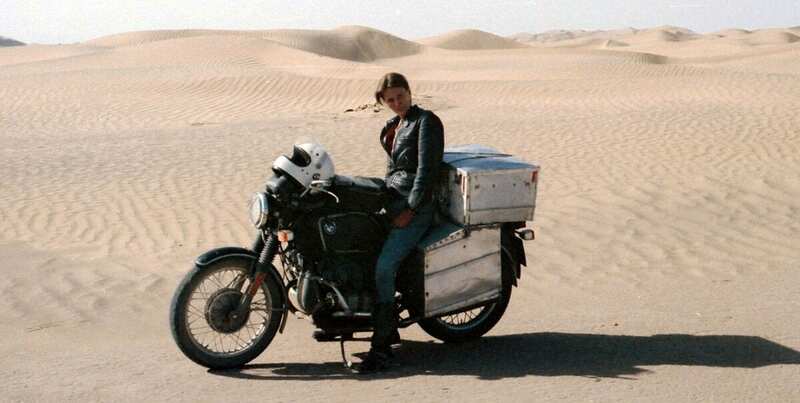 A BMW R60/6 is already a bit old and therefore perfect for such a trip. 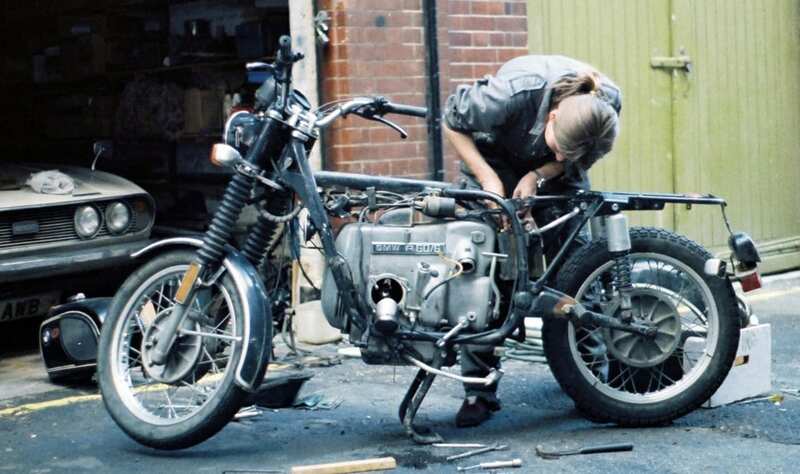 She is not afraid to take it to bits, fix things and put it back together either. Next clue, direction. She chose to head west, taking in America first and then Australia. Instead of the gradual shifting of cultures experienced by riding overland from Europe to China, we get cultural jolts separated by oceans. Finally, there is no clear reason of ‘why’ for this trip, she admits to a lack of vision from the outset. Just a restlessness, an uncertain need to motor. This is the point where I begin to like the book. 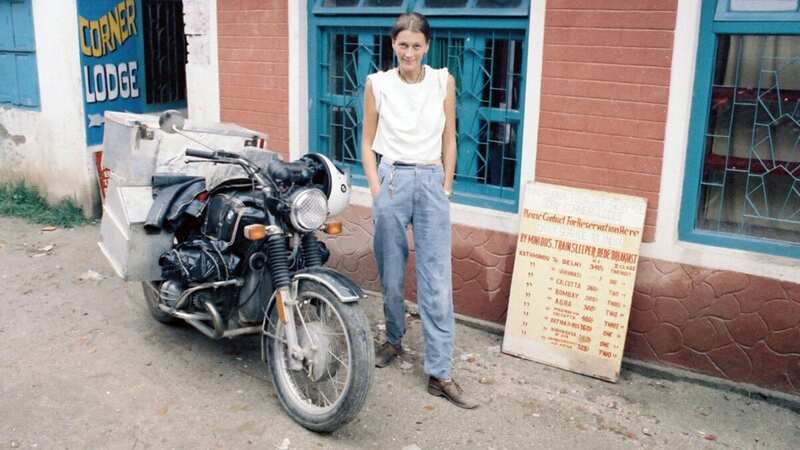 The American reception of a solo woman on a motorcycle is a bit unexpected. 1980s America appears uncomfortable and even a bit creepy. I’m shocked. I was travelling some of those same roads around the same time. Is that truly how women were/are treated? 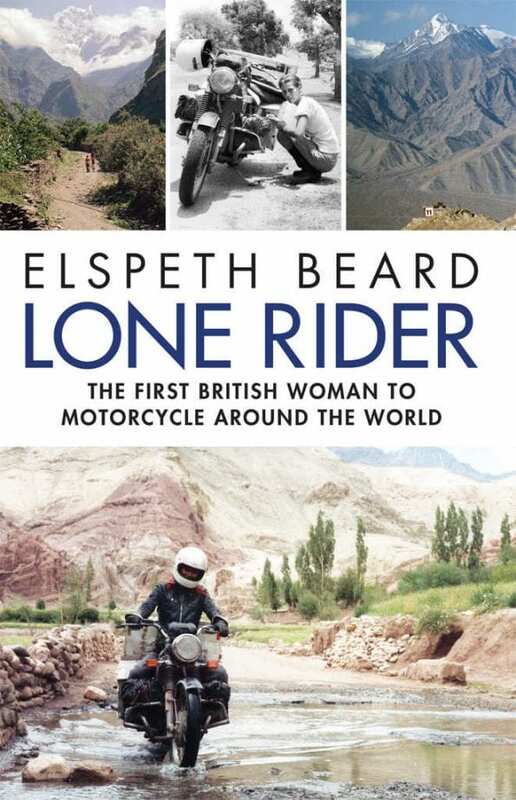 Why is a single woman with a slightly posh accent, on a quiet, civilised motorbike, seen as a threat? The long roads that follow give time for a fuller consideration of all those carefully explained relationships at the beginning. Miss Beard, I discover, is a good writer; the story is compelling, and I want her to get to California. Spoiler alert: she does make California. In preparing for New Zealand, all the arrangements are her responsibility. Paid in cash, in advance; don’t understand the rules? It’s your problem. It’s not all like today where you can click a mouse, a person shows up at your door and hauls your bike across the world. The people from her London life travel almost subconsciously with her. They are invisible and out of touch except for an occasional overseas letter, but they are certainly along for the ride and at times they are main characters. The story gets deep, complex, and satisfying. Hundreds of hours alone in thought, over a rumbling engine, in the moment as they say, is one way to sort things out. New Zealand and Australia arrive with crushing defeats, pain, loss, more odd cultural shifts, an impressive success story, and a few meteorological jolts. 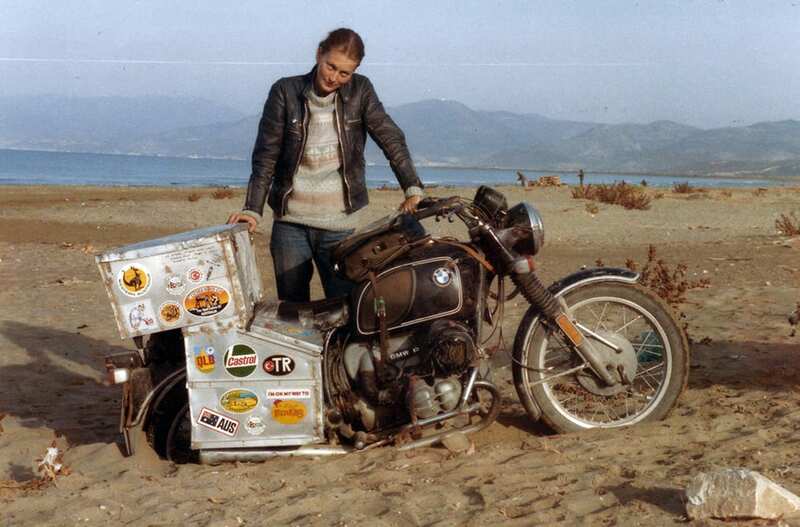 Our hero rides the heavily-laden BMW through conditions that would challenge the best motocross bike. Australia means rain, lots of it: I would have never guessed that. We’re more than ready to leave behind the western world, which seems somehow suffocating, as we board a ship to Malaysia. Some friends of mine who have been on such trips have warned me that you don’t really travel in Asia; you become a part of Asia while working toward a destination. Concrete plans and schedules are suggestions, not reality. Westerners in general and our hero in particular struggle mightily with this idea. The era’s political and social ills play out in Asia. Abject poverty and spotless plastic Singapore arrive, along with the peak years of the region’s narcotic trade and brutal dictatorship governments. Oddly, it is the totalitarian nations that seem to have the friendliest and most efficient customs officials. In India, a customs agent who demands pornographic magazines instead of bribe money had me roaring with laughter. India is often the country with most high and low points found on any long trip, and it does not disappoint. 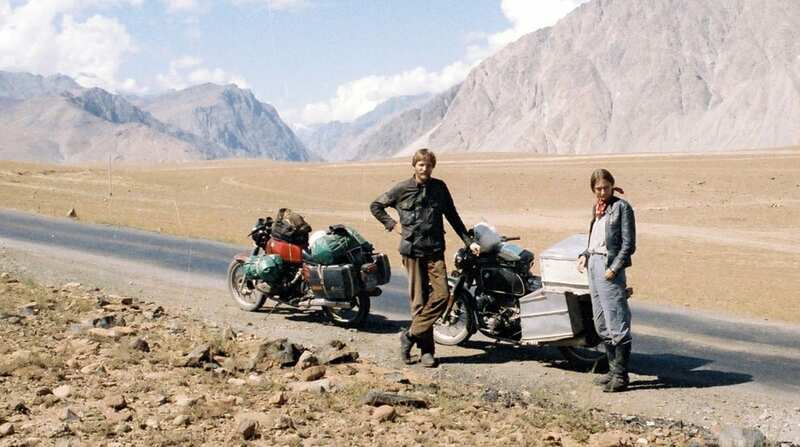 A new travelling companion (not in the subconscious but in real life) emerges, and the story takes an unexpected direction as the pair of BMW-equipped riders agree to stay together all the way to Europe. Those shadows of people back home are still very much with us and not entirely happy, of course. Iran and Turkey are huge places and, thankfully, good quality maps are included throughout the book. The Islamic state of Iran, not long after its revolution, looms in the news reports of the day, and a threatening ‘No Westerns’ warning sign at border creates major anxiety. Which is the better way? Angry Iran or war-torn Afghanistan? Iran’s bark proves worse than its bite, and in most places Elspeth is treated as a respectable guest. Europe rolls into view. We feel the opposing cultural jolt of rising prosperity, automobiles everywhere, and the first visibly obese people spotted in a very long time. Fatigue, mechanical doubts, and ever-present bad weather give the travelers a kind of ‘hurry up’ push across Europe. This must be the rainiest travel adventure I’ve ever read. Golly, was she wet and cold, and muddy. The twists and turns continue into the post-trip life. What do you do when you’ve been around the world and then return home? This is a common troubling theme in RTW travelogues. How do you relate a story to loved ones who can’t come near to understanding where you’ve been or what you’ve done? Beard’s London life bursts out of her subconscious mind and back to the real world. Things are not that great. And that travelling friend from India? He is now forced into the background, somehow still an important character and one I am truly rooting for. Elspeth, our hero, winds her way through a stack of emotions, career, and family. 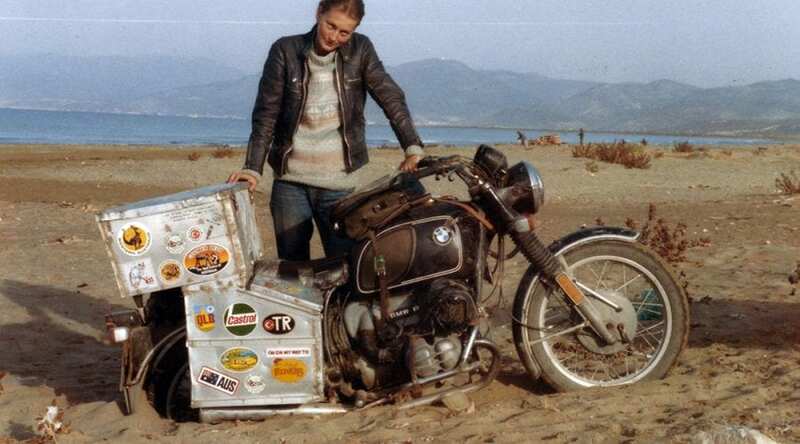 Sadly, even the loyal BMW R60 is shoved aside for period of time. There is an ending, but you’ll have to read it; I’m still processing. On my next trip to the UK I must seek out that water tower even if it is just a glimpse from the outside.